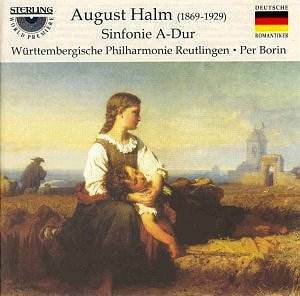 August Halm was a talented if not genuinely gifted musician whose rather sizeable output has been for the most part neglected over the years. Remembered more as a dedicated music teacher than a composer, he began life as the youngest and rather pampered child of a clergyman. Reared in a particularly scenic area in Thuringia, his life was on the whole as tranquil as his surroundings. His attempt at following in his father�s ecclesiastical footsteps soon came to failure, and at the encouraging of friends and mentors, Halm focused his studies on music, giving lessons and composing near his native city for his entire life. His A major symphony certainly reflects his idyllic homeland. It is a substantial work, nearly an hour long and it begins with tremendous promise. The opening movement is truly a work of great reflective beauty, even if you factor out the obvious influence of Bruckner within its inner melodies. No boldly striding Brahms this, rather, Halm sets out to create something lovely, and quite handily succeeds. The slightly shorter second movement is sublimely serene; a testament to the somewhat lost art of creating something beautiful for the simple sake of beauty. It is easy to become quickly lost in this tranquil, tuneful music. Alas, it is here that the composer seems to run out of steam, and the third movement, called a szene, seems to head off in no particular direction. Henceforth, the symphony never recovers. Halm attempts to be conclusive and direct as he finishes his composition. There is, however, not enough significant material either rhythmically or thematically to pull it off, and what started out as such a hopeful find rather disappoints as it concludes. Like the work itself, the Württembergische Philharmonie Reutlingen begins with great promise. They possess a splendid balance between sections and capture the serenity of the first two movements beautifully. Things go a bit awry by the finale however, as ever so slight intonation problems in the winds and brass, coupled with a palpable lack of forward motion bring what could have been a satisfactory finish to a let-down of a lumbering fade out. Although I cannot give this recording or the work for that matter my whole-hearted approval, I can recommend its purchase for the first two movements, which provide twenty-eight minutes of truly gorgeous music and musicianship. This is a gem-let that is worthy of the occasional hearing. Alas, it does not quite meet the standards of greatness.